I am pleased to report the following breaking news: Along the shores of the beautiful beaches of Europe, the Speedo is on the decline. That’s right, my friends. Based on extensive observation over the past two days here in Cannes, I can confirm that European men are now wearing swim shorts to the beach. Standard-length, thigh-covering, leave-a-little-to-the-imagination-please, swim shorts. No more bulging out all over the place, so to speak. Surfer-wear, skater-wear... it seems European men are now taking their beach fashion cues from the likes of SoCal's Manhattan Beach. I never thought I would see the day. Of course, there are exceptions to this surprising new fashion trend. The over-65 set, for one, who cling tight (pun intended) to their Speedo-wearing ways. These guys have been letting it all hang "loose" for as long as they can remember, so why change their seaside style now (especially now that everything about their bods really is loose!)? And of course, the Italians. God love ‘em, those Italians will go down fighting for their right to expose their every curve for all the world to admire, no matter how wrong the entire look turns out to be. Well, admire is probably not the word I should use, but I have to admit their complete lack of self-consciousness – that of both the shameless Italians and the senior crowd, in fact – is utterly refreshing. So here I am, lolling at the beach, blissfully wasting away the hours slathered in sunblock, flipping through French gossip magazines (which for the record cover the same trash as their American counterparts, but in French)... This weekend in the French Riviera is just what I needed to recharge, refresh, and escape the daily grind of life in The Big City. Oh who am I kidding?! Other than my daily cup of coffee, there is no daily grind in Paris! So far, my summer has been one ridiculously easy-going holiday. As the heat settles in, everything and everyone seems to have slowed down. But a weekend away to the French Riviera? Guaranteed to offer the most excellent people-watching opportunity of the entire summer? And, I don’t need to take an airplane to get there? Sign me up. I suppose it’s a very good thing I did get away, because it just so happens that July is a Very Dangerous Time To Be In Paris. Terrorist attacks, train bombs, civil unrest in the banlieus, heatstroke... NO! I refer to NONE of these things. Rather, the danger comes in the form of two innocent little words: LES SOLDES. I shudder at the mere thought. Every July, across the entire country of France, every single shop – clothing, shoes, bags, jewelry, even chocolate – slashes their prices and announces that the Sales Are On for the month. (This is so unlike the place where I come from, where sales happen on a daily – sometimes hourly – basis, for any and every reason whatsoever.) 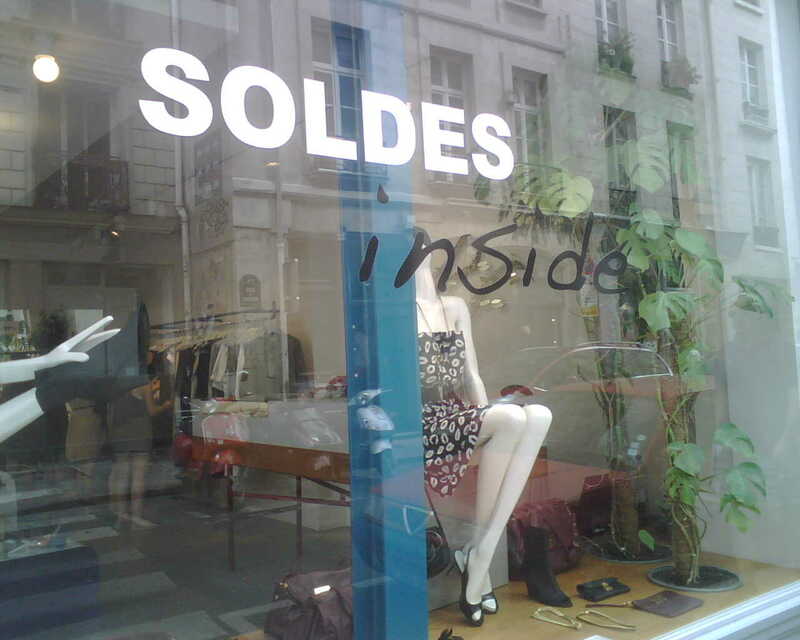 The July sales in Paris, subsequently, are the event of the summer. And we are talking deep, deep discounts (-40%! -50%! -60%!) on some of the most gorgeous shoes and dresses I have ever seen. Adding to the DANGER of it all is the Euro’s sudden resuscitation in recent weeks, steadily on the rise, crushing the fragile ego of the US dollar... not to mention my own spending power. Somebody make it stop! Better yet, somebody stop ME! I had no choice, I needed to be sent away to the Coast for a long weekend of Shopper’s Rehab. Yes, yes, LES SOLDES do extend all the way into Cannes, but I have been far too busy sleeping in sand to pay much attention. And anyway, shopping in Cannes – in the form of Dior, Balenciaga, D&G, Yves Saint Laurent – is way beyond my bank account.